As my daughter gets older, there's no doubt her interactions with and perceptions of the world have changed, and, no matter how progressive and understanding a parent I might believe I am, to see her lose any of her child-like wonder or innocence doesn't feel good. Obviously, she's going to grow up, and I shouldn't hold her back, but at the same time, as an adult, I know she has the rest of her life to be a grown-up, and childhood is increasingly short, so it should be embraced. With that mindset, Insight Out, the story of how the mind of a young girl changes with adolescence, was a shot directly to the heart. Young Riley's had a pretty great life in Minnesota, playing hockey and enjoying time with her parents, which has made for an easy life for Joy (Amy Poehler), the emotion that rules Riley's life. Joy works with Anger (Lewis Black), Fear (Bill Hader), Disgust (Mindy Kaling) and Sadness (Phyllis Smith) in Riley's head, guiding her reactions to life. She's put to the test when Riley's parents up and move to San Francisco, uprooting her life and upsetting her good time, especially when her parents don't have the best of times following the move. The effect to the emotions is worse, as Sadness takes hold, and then her and Joy end up lost in Riley's memories, leaving Anger, Disgust and Fear in control. It becomes a race against time for Joy to save the day, but she's going to need some help. While Riley copes with a new school and all the stresses that come with trying to fit in in a new place, much of the film takes places in the world of Riley's mind, which the filmmakers have masterfully designed to represent the functions of memory and emotion in a way that makes perfect sense the first time it's explained. Though the characters have to lay a bit of pipe in terms of how things work in this world from a process perspective, once that's done (early in the going) everything else emerges from the system naturally, revealing just how clever the concept is. Earning that kind of understanding from the audience frees the movie to simply tell the story and let the characters shine. It's those characters that make the film work in the end, especially Joy, whose sunny disposition gives the film its energy and attitude. It's hard to imagine anyone but Amy Poehler giving voice to Joy, bringing everything that made viewers love Leslie Knope, yet somehow coming off as even more caring, even getting the opportunity to really impress in a dramatic turn. And though Kaling, Hader and Black all are well cast for their own characters and the emotions the represent, Smith as Sadness is just perfect, giving Poehler an excellent foil and nailing the concept of sadness in a way that manages to not feel excessive. However, if Smith is perfect as Sadness, Kind was born to play Bing Bong, giving genuine heart to a naturally over-the-top character. 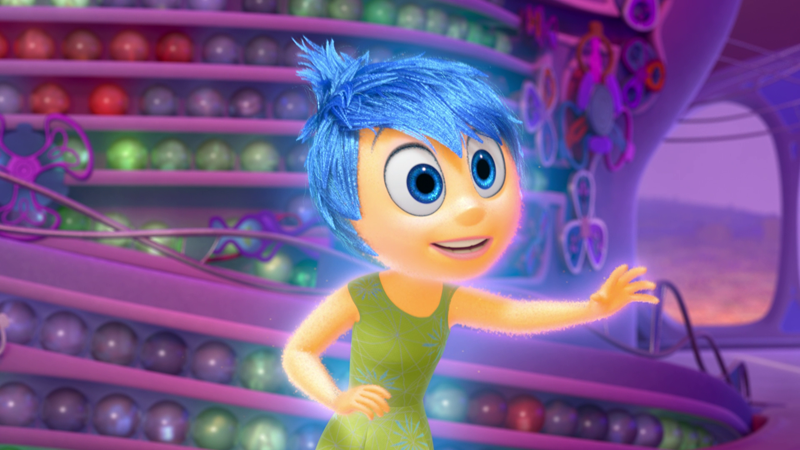 Like all great Pixar films, Inside Out trafficks in humor, adventure and, most memorably, heart-wrenching emotion, the kind that's particularly difficult to deal with for anyone with a child of their own (especially if that child is a girl like Riley.) However it's not just the parent-child relationship that's touching. It's also the way the film represents the changes that maturation brings inside the mind and that which is lost as childhood is left behind, with Riley's one-time imaginary friend Bing Bong perfectly personifying the unfortunate by-products of growing up. For anyone familiar with Pixar's work, it should come as no surprise that the filmmakers show a preternatural understanding of human emotion and can play the audience like a fiddle. 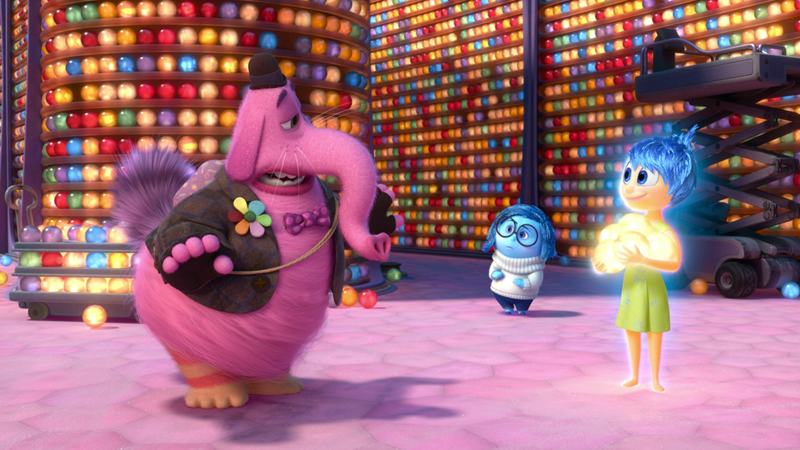 When it isn't attempting to tear out your heart, Inside Out can be quite funny. The idea that everyone has the same, if personalized emotional set-up in their heads is utilized effectively for laughs, as are several concepts drawn from psychological theory, including the effects of abstract thought, as are the way the emotions interact with each other and Riley's life (like the headlines on Anger's newspapers and Disgust's general...well, disgust with the universe at large.) 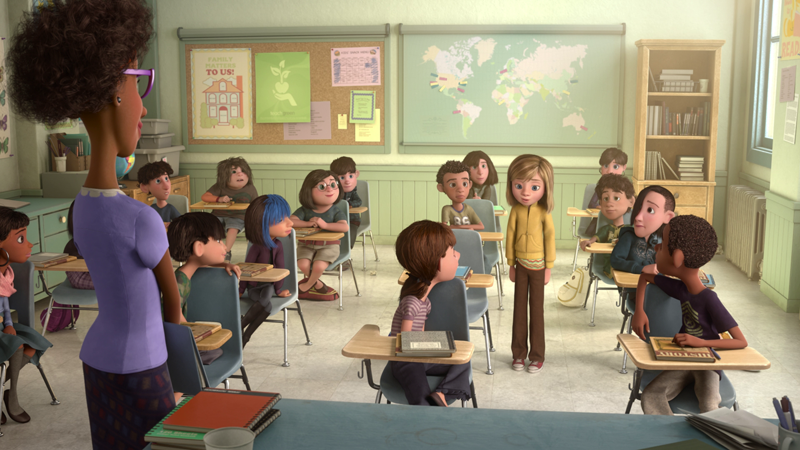 In the big picture though, despite the epic scale of the emotions' world, InsideOut is a more intimate film than most of Pixar's output since director Pete Docter's Up, focused on character as much as it is on plot and situation, yet succeeding at all of it. What a terrible looking film. Yeah, sure. The reality is that the 1080p, AVC-encoded transfer here is just stunning. If you want to see where this presentation truly excels, it's in the hair and fuzz on the emotion characters. When details that small come across so wonderfully, you know you're doing well. This film is loaded with challenging material, whether it's the glass memory balls or the detail of the memory archives. The level of fine detail is tremendous, color is vibrant and lush throughout, while black levels are deep and solid, important for a key scene. There's nothing about the visuals here that's worth complaining about. Just gorgeous throughout. Where the transfer displays brilliance, the DTS-HD Master Audio 7.1 keeps pace, offering an immersive track that's dynamic and active, utilizing seven main channels to position sound effectively and move audio around the soundfield, while the low-end grounds the audio. Dialogue is clean and clear, enjoying some quality directionality, atmospheric effects support the film by putting the viewer in the middle of the action, while the music is strong and well-layered.The movie's artistry extends to the audio, which has fun playing with sound in relation to what's happening on-screen, creating some unique aural moments that enhance the creativity in the film. On the main disc, we start with the touching short film that unreeled before Inside Out in theaters, the island-themed Lava (7:12). A musical fable about romance between a pair of anthropomorphic volcanos, written and directed by James Ford Murphy, it's narrated through a Hawaiian slack-key guitar song and hits all the right notes of emotion one expects out of Pixar, with some beautiful water animation techniques that are likely to become a part of the upcoming Finding Dory. Riley's First Date? (4:40) gives another look into the minds of Inside Out's stars, as Mom and Dad cope with the possibility that Riley is going on her first date with her fluffy-headed friend Jordan. Sadly, this short doesn't do much to expand on what was seen in the film, and outside of Mom's awkward attempt at "teen speak," it's not that funny. Seems like a bit of a waste of so much talent. The film has an optional audio commentary from director Pete Docter and co-director Ronnie Del Carmen (with director of photography Patrick Lin and Hader joining in for a bit, and an attempt for another guest.) The two leaders come in with an agenda to discuss three main topics, history, invisible story and cinematography, as Docter notes that those things are not obvious when watching a movie. In reviewing themes and techniques that went into the film, they hit their marks, offering solid insight into how the film was made (with Hader providing some outsider perspective on Pixar process) while also giving more info about the filmmakers intentions. "Paths to Pixar: The Women of Inside Out" (11:22) offers a well-edited group of interviews with women from the cast and crew on the film (including Poehler, Kaling and Smith), who discuss the development of their personalities and their careers, including their dreams and the ways they pursued them. They also talk about how they overcame challenges that came from within themselves, such as issues with confidence and concerns about balancing family and work. It goes off the rails a bit when there are attempts to tie in closer to the film, like asking which Inside Out characters they most relate to, but overall, it's an excellent spotlight on the women who helped made the film happen and helpful guidance for young female future film folk. "MIxed Emotions" (7:17) focuses on the role of emotions in the movie, including the research done to understand them. A quick peek at some of the emotions cut from the movie gives way to an illustrated discuss of the design effort on the core characters. It's great to see some of the early versions of the characters, as well as to hear about the thought process behind the animation in the film, like dealing with a lead character that exudes light and the influence of 2D animation. A second Blu-ray holds the rest of the extras, including a six-part "Behind the Scenes" collection. (It is safe to say you should not watch these extras before watching the film, as there are a lot of spoilers.) The behind-the-scenes goodies kick off with "Story of the Story" (10:30), a featurette on, naturally, the story. The key creative crew, including Poehler and Hader (who helped guide the story), discuss the progress of the story's development, including a multitude of variations on the plot and characters and stumbling blocks they ran into along the way. A peek at how Docter solves the film's story problems gets to the core of why Pixar works as well as it does. "Mapping the Mind" (8:24) focuses on the effort that went into the design of the film in terms of the sets, and how the functions of the mind were translated to the movie, with info on the input of experts in the field of psychology and the influences the team utilized. As this was one of the most brilliant elements of Insight Out, managing to be both original and inherently logical, this is a fascinating area to explore. There are a few preliminary versions of the mind designs highlighted here, which all would have resulted in very different movies. "Our Dads, The Filmmakers" (7:25) is a mini-documentary featuring Docter's daughter Elie and composer Michael Giacchino daughter Gracie, with the two longtime friends following their fathers as they work on the movie. A bit of a Pixar studio tour is combined with good insight into the production process, particularly on the music side, with a touch of authentic girly goofiness thrown in for good measure. "Into the Unknown: The Sound of Inside Out" (7:09) is another literally-named featurette, this time focusing on the film's sound design, which offered the challenge of creating a world that's never existed, as well as multiple levels of reality. This is an area of filmmaking most people never think about, and this featurette shines a bit of light on its difficulty and importance. "The Misunderstood Art of Animation Film Editing" (4:43) obviously has a bit of an angle, considering the title, but it does it helps explain the role of the editing team rather clearly. It certainly seems to be one of the more difficult jobs on the film, relying on everyone else on the team and numerous re-dos to get to a final product. Four deleted scenes are available (16:53), with introductions from Docter, who explains how much work went into these clips, and the thought process behind their creation and removal. Presented as animatics with temp voice tracks, they feature early designs of the characters and concepts that didn't make it into the film, including the revelation of a major change to the plot that worked out very well in the end. A few things here would have been fun to see in the movie, but the evolution of Joy's character from what's seen in these early attempts was hugely important. 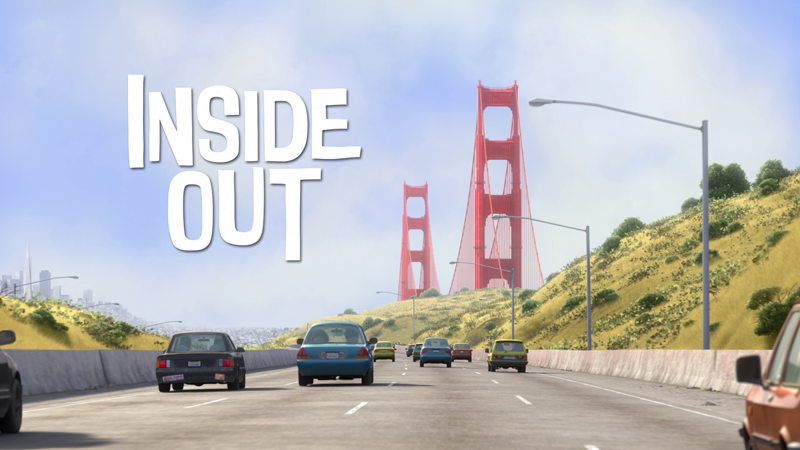 A trio of Inside Out trailers are available to check out. "Remember" (1:38) represents the core five emotions in the film with a montage of clips from the rest of Pixar's films, before introducing the characters, while "Experience" (2:19) is a more plot-based promo. Then there's the trailer for Japan (2:30), which is exceedingly heavy-handed in explaining the film and pushing the drama. It certainly makes one want to watch the Japanese version, to see if the translated dialogue takes on the tone of the voiceover here. Wrapping things up, in addition to some trailers, there's also a code for a Digital Copy, as well as the Pixar maximizer, for calibrating your set-up. Perhaps being the father of a young daughter led to some bias when it comes to Inside Out, but watching Riley and Joy fight their way through their separate and shared situations, all of which is delivered with Pixar's trademark creativity, humor and heartfelt emotion, one can't help but be enamored with the film, its characters, its story and its artistry. On Blu-ray, it looks and sounds dynamite, and is supplemented by a great deal of bonus content that both entertains and informs about the animation process. If you like Pixar, you really should add this one to your collection, and if you're a parent, that goes double.